Early morning temperatures in the 60s and 70s will climb to highs in the mid and upper 80s again Tuesday in South Florida. The above average temperature trend will continue through the work week. 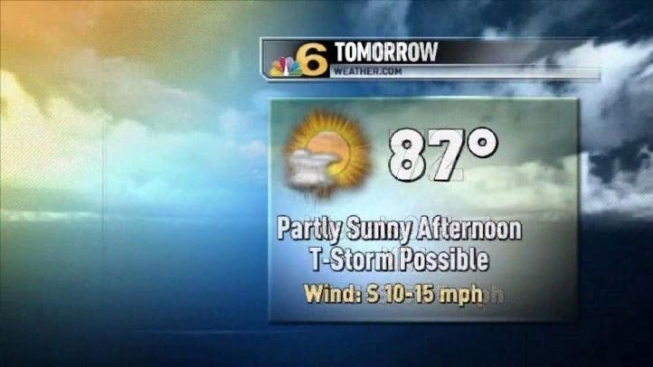 Although shower chances Tuesday will be only 10 percent, a stray shower cannot be completely ruled out this afternoon. Mostly sunny skies will persist through the morning then scattered clouds will mix in during the second half of the day. Inland fog is possible through 9 a.m., and western suburbs will have the best chance of patchy fog. South Florida will experience a better chance of afternoon convection mid and late week. Scattered afternoon thunderstorms will likely develop Wednesday, Thursday and Friday. The best chance will be Friday along a passing front.